Demonstrators chant slogans and flash the Oromo protest gesture during Irreecha, the thanksgiving festival of the Oromo people, in Bishoftu town, Oromia region, Ethiopia. For 11 long months the government was content to quell protest and to release information in dribs and drabs, the epitome of one-sided doublespeak. A handful of cryptic press releases repeated the same platitudes ad nauseam. When in June 2016 the ruling power finally realized the severity of the crisis, launching a series of internal deliberations, these took place in total secrecy. This pseudo-communication destroyed its credibility and in turn lent credence to the sole alternative source of information, the diaspora, which itself is often hyperbolic to the point of implausibility. On both sides, the space available for information that exhibits even a degree of measure, not to say simple rationality, is shrinking alarmingly. An even more serious indictment is spreading. The government’s primary role is to maintain law and order, and it has proved incapable of doing so; worse still, the violence of repression is further fueling discontent. In the end, rather than fulfilling its first duty, the ruling power has become the principal cause of revolt. In other words, what is at stake is the place that should be assigned to the “people’s fundamental freedoms and rights” enshrined in the constitution, collective rights. How can the country make the transition from a bogus and ethnically weighted federalism to real decentralization, which would bring about a more authentic and ethnically fairer federalism, or even confederalism? The immemorial “national question” remains as acute as ever: what will the name Ethiopia come to refer to? In other words, why should and how can an Ethiopian state exist, and on what basis? For the Amhara, whose elite dominated Abyssinian power for more than a century, the challenge is to revamp their identity. They have to say farewell to their historical ascendancy and accept that their place in the Ethiopian state should reflect their numerical and economic importance, no more, no less. In other words, the only way out of the undoubted ostracism they suffer is not to re-establish the former status quo. The assertion of “Amhara-ness” – legitimate as it is – cannot become a cover for the aspiration for a return to an “Ethiopianness” based around Amhara, with the other ethnicities in a lesser role. This metamorphosis is under way, but not yet complete. Nonetheless, many Oromo and even more Tigrayans deny that anything has changed, convinced that this elite has not abandoned its “chauvinism” and “revanchism”, and that the federal system that they defend tooth and nail could therefore never satisfy its deeply cherished ambition. The present crisis is particularly acute because these three factors reinforce each other. The demonstrators chant “we want justice” and “we want freedom”, but also “Oromya is not for sale” and “we want self rule” or, in Gondar, the historic capital of the Amhara, “respect for Amhara-ness”. They ascribe the crisis to the breaking of the bonds between “the people” and the party. In their view, those most responsible are the regional parties, starting with their new leaders. The urgent priority is to restore those bonds and to reinforce central power, to compensate for the failures of the regional authorities. They will only be able to conceal and perpetuate those benefits as long as the Party remains a bunker. Any opening up, any movement towards a little good governance, transparency, and accountability, would be the end of them. They are also haunted by the implacable rule of “winner takes all” that has accompanied every previous regime change. However, their attitude is ambivalent. On the one hand, they are tooth and nail defenders of the EPRDF’s monopoly of power, and therefore equally implicated in the repression. In the Amhara region, it is equally unquestionable that the big initial demonstrations, though officially banned, were held with the support or tacit approval of part of the ANDM. 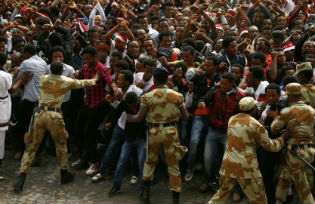 At least at local level, the authorities and the security forces allowed “ethnic cleansing” against Tigrayans to take place, prompting 8000 to flee to Tigray. Gedu Andergatchew, ANDM strongman, who is accused of having at least turned a blind eye, is still in place. Regarding the “national betrayal”, these critics highlight the old guard’s loyalty to its Marxist past, claiming that they remain “internationalist”, “cosmopolitan”, and “universalist” out of political ambition and material interest. Addis Ababa offers positions and advantages that Tigray, poor and small as it is, would be hard put to provide. The more the balance between centre and periphery shifts towards the centre, the more attractive these positions and advantages become. In short, the view is that the old guard has yielded to a centuries-old tradition of Ethiopian history: letting itself be “assimilated” by the centre and prioritizing the latter’s interests over those of the periphery. As the historian Haggai Erlich has written, “a central position” in Addis Ababa has always been preferable to remaining a “chief in a remote province”. In consequence, these Tigrayans feel they have no other choice than to take charge of their own destiny and count only on themselves, i.e. something like building a “fortress Tigray”. It is up to the new generation to take over from the old, which has given up, even if this means embracing the “narrow nationalism” of which its critics accuse it. This goes as far as to see a re-emergence of the hope of reunifying Tigrayans on both sides of the Ethiopia/Eritrea border into a single nation state. The state of emergency was proclaimed in order “to deal with anti-peace elements that… are jeopardising the peace and security of the country”. Commentators see it as evidence that the regime was “overwhelmed”. But it adds little, whether to the existing legislative arsenal, or to the operational capacities of the security forces since, in practice, they have never seen themselves as severely restricted by the law. The first objective is to instil fear and uncertainty, especially as several provisions are so vague that they can be interpreted in almost any way. They are now in everyone’s mind. For example, for the first time, long-standing informants have cancelled interviews because of the potential risk. The main problem is deficiencies in implementation. In sum, things have gone off the rails because of human failings. Yielding to corruption, bad governance, lack of accountability, etc., “leadership at various levels of the government structure has miserably failed to fully and timely[sic] address the demands made and the questions raised by the people”. The response to the crisis must therefore take two forms. First a massive purge at all levels of the Party, regional governments, the administration. Then, “to delineate” – the new watchword – the Party from the government, from the Assemblies, from justice, etc. in order to develop a system of checks and balances, since the self-correcting mechanisms within the Party have proved inadequate. In strictly political terms, “our democratization process is still nascent. It is moving in the right direction, but it has not yet come up with inclusive engagement”, stated the PM. Electoral law will be reformed to introduce an element of proportional representation into majority rule. However, the next elections are in 2020, and the dozens of opposition MPs present before the 2005 elections could do almost nothing to temper the authoritarianism of the regime. The essential thing is “to discuss… with all stakeholders” in all possible and imaginable “debating platforms”, “assemblies”, “fora”, but with no specific goal or timetable, and under the sole authority of the EPRDF. A promise reiterated year after year, without impact. One of the essential causes of the crisis, its federal dimension, is covered in a single short sentence in the 15 pages of President Mulatu’s speech: “more should be done for the effective implementation of the federal system”. In any case, “Ethiopia is an idol… and exemplary for the world for peaceful [interethnic] coexistence”, declares the State Minister for Federal Affairs. According to them, the regime is relying first on repression, and on reforms only as a “footnote”. Merera Gudina, a long-standing leader of the opposition, sums up the general sentiment: “too little, too late”. Nothing has been done to reach out to either the main opposition forces, even the legal opposition, nor the civil society or the media, quite the contrary. This could be envisaged only after the end of the state of emergency, Hailemariam is said to have told one figure from the international community. These interlocutors share the dark pessimism of an editorial in the Washington Post: “the state of emergency will bottle up the pressures even more, increasing the likelihood they will explode anew… It won’t work”. According to this view, the chances of a genuine opening up on the part of the regime are so small that there is a high probability that the worst will happen: a threat to the very survival of the country, the only question being when this dislocation would occur. To do this, it is necessary and sufficient to put an end to individual erring through the self-reform of the EPRDF, i.e. reform by and for the Party itself. To achieve the famous “delineation”, MPs, judges, ministers, civil servants, etc. would split themselves in two, remaining obedient to the Party but putting their mission first. Why would they do this, given that they never have before? “Because they have become aware of the crisis”, is the explanation. So responding to the crisis requires no systemic reshaping through the establishment of independent counterforces. A U-turn in individual behaviour will be enough. They have a clear view of where they want to go, which is to apply the constitution to the letter, but over a very long timescale and with no precise and concerted idea of the steps needed to get there. As for their rank-and-file adherents, they make no secret of still embracing the same paradox: we need reforms, but we need a new strongman to manage and impose them, for fear that they will otherwise lead to chaos.